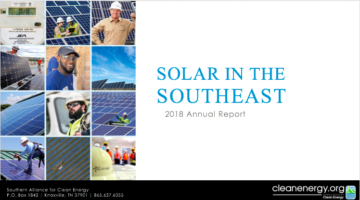 We are pleased to release of the second annual "Solar in the Southeast" report and hope that you will find the data and analysis both helpful and interesting. We updated last year's report with historical data through 2018, and also provide a look ahead with a four-year forward forecast to 2022. Watch a recorded webinar covering this report in detail. As solar announcements pop up throughout the Southeast, sometimes from a large corporation such as Facebook or Google and sometimes from a utility, it can be challenging to keep track of what current trends and solar news mean for the Southeast solar market as a whole. Here at SACE, we have found it helpful to take a step back and review solar development through an unbiased, apples-to-apples metric, which is one of the reasons we developed this annual report: “Solar in the Southeast”. Today, we are pleased to announce the release of the second annual report and hope that you will find the data and analysis both helpful and interesting. We updated last year’s report with historical data through 2018, and also provide a look ahead with a four-year forward forecast to 2022. To provide an equitable, unbiased comparison of various-sized utilities throughout the Southeast, SACE ranks utilities on the basis of watts per customer (W/C) of solar power. The 269 W/C solar ratio we observed in 2018 represents a 63% increase from the comparable 2017 W/C ratio. The Southeast exceeded 8,000 MW of solar capacity in 2018. SACE has increased its forecast to 17,000 MW by 2021 and nearing 20,000 MW for 2022. Duke Energy Progress (DEP) remains atop the leaderboard on watts per customer solar ratio. Duke subsidiaries combined can boast half of all solar in the Southeast from 2018. South Carolina Electric & Gas (SCE&G) emerged as a solar leader in 2018. SACE had identified SCE&G as a “SunRiser” in last year’s report and it is starting to deliver on that ambition. Florida is beginning to live up to its nickname “the Sunshine State.” It has already surpassed Georgia on installed capacity and by 2022, SACE forecasts solar capacity in Florida to exceed that of the current regional leader, North Carolina. Florida Power & Light (FPL) recently announced the boldest 10-year solar commitment of any utility in the country. This will more than double the annual pace of solar expansion for the largest utility in the Southeast. Corporate procurement is driving new solar development in the Southeast (and nationwide). Facebook, Google, Target, Walmart, and Johnson & Johnson each announced major solar projects in the region. SunRisers: We have some new entrants on this list of solar leaders. Walton EMC, FPL and Orlando Utilities Commission (OUC) join four returning “SunRisers” demonstrating leading levels of planned solar growth over the next four years. SunBlockers: We also have some repeat offenders. Santee Cooper, Seminole Electric Cooperative and the Tennessee Valley Authority remain on the list of utilities whose forecast solar ratio for 2022 will remain below the region average from 2018. In subsequent blog posts, I will unpack some of these observations with more detailed analysis. If you have questions about any of the content in the report, I encourage you to email me at bryan@cleanenergy.org, as these questions may be helpful to address in upcoming blogs. In case you need that download link one more time, you can download and read our new report here. Last week we hosted a “Solar in the Southeast webinar!” Watch the recording where we dug into some further analysis of this report’s findings. The webinar is free and open to the public. Read Part 2 of the “Solar in the Southeast” report. Where we highlight 2018 SunRisers in the Southeast.